I promised you guys some meatball action today. 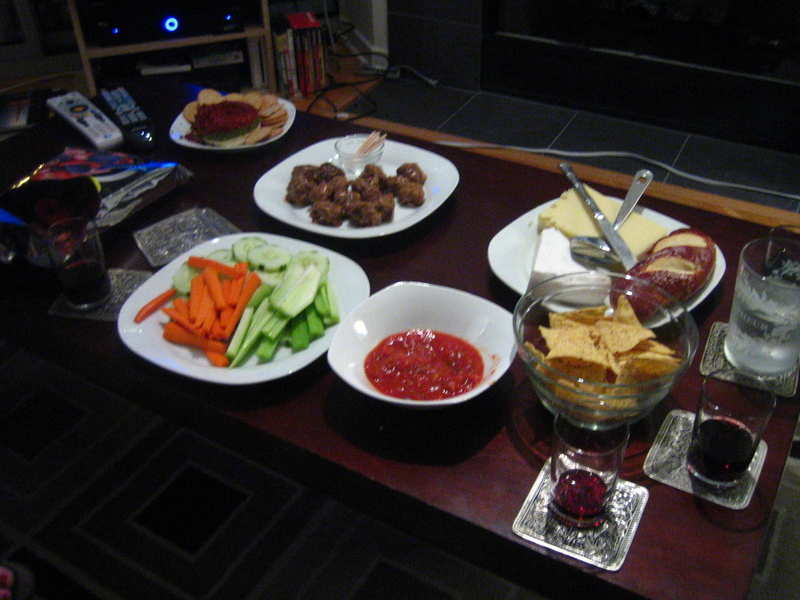 It has become bookclub tradition for the host to facilitate some kind of light appetizer spread for the group. I clearly have no problem with this. In fact, I don’t think I really understand the meaning of “light”. 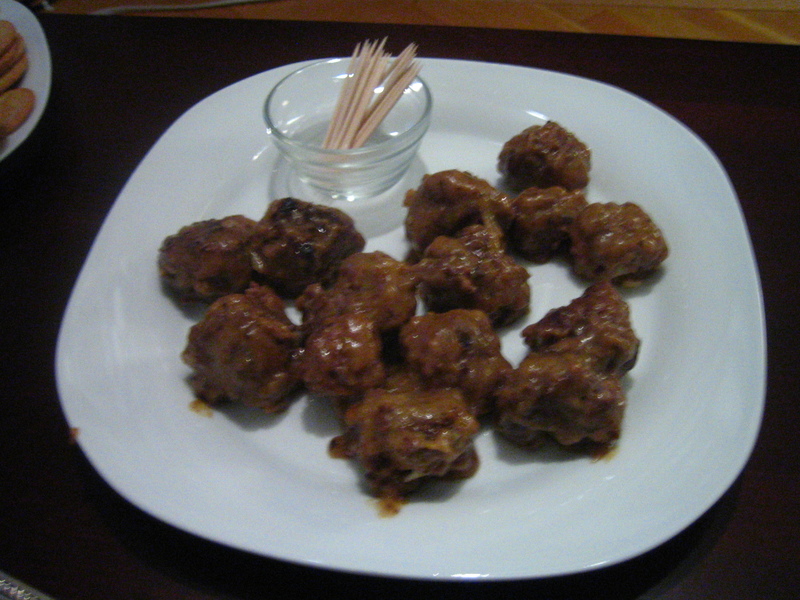 I made the meatballs the way my dad makes them and the way his mom made them before him. They’re not low-fat and they don’t have any gourmet ingredients in them, but they’re 100% real food and they taste like Mom’s kitchen. These meatballs will take you back to a time when you didn’t have big kid worries (bills to pay? psshh.) and make you want to snuggle up with your Snuggie. I recommend making them for Sunday dinner. Finely chop onion. I’m not talking dicing it. Take your aggressions out on that onion and take some good whacks at it with your knife until the pieces are really pretty small. Combine beef, onion, breadcrumbs, egg and some salt and pepper in a bowl and mix until combined. Form into balls slightly smaller than a golfball. Maybe the size of an eyeball. But that’s gross and I don’t want to put that image in your head. Let’s stick with runt golfballs. Melt about 4 tablespoons of butter in a skillet over medium heat. Add balls to the skillet and brown on all sides. Once they are good and browned remove from pan, reserving butter in skillet. If it looks like the meatballs have soaked up a lot of the butter, add a few tablespoons more of butter (up to 4 more if you’re feeling crazy) and melt. Add flour to the butter in the pan and whisk to combine. You’re making a roux, and it should be the consistency of grainy toothpaste (but don’t brush with it. It won’t do you much good). If you’re using a boullion cube, this would be a good time to dissolve it in some water. About 2 cups will do you. Slowly whisk in broth, whisking and making sure to scrape up the brown bits on the bottom of the pan. Add enough liquid until the gravy has come to a gravy-like consistency. It’s its destiny. Then add a bit more liquid so that it’s a little on the thin side. Season to taste with salt and pepper. 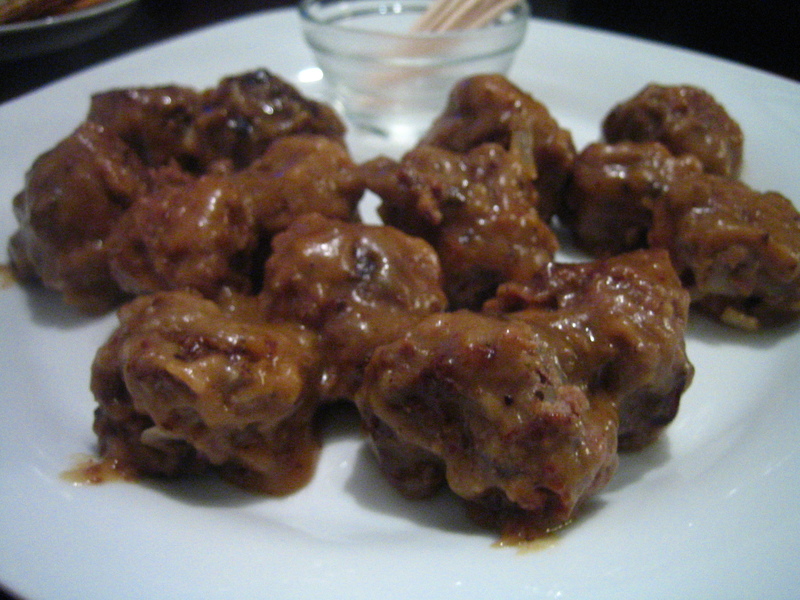 Reduce the heat to low and add meatballs back to skillet, coating with the gravy. Let them simmer for a few minutes and serve. I served these guys with toothpicks since they were more of a cocktail snack, but the way we really serve them is over a bed of plain white or brown rice. Very coma inducing. Even better with a glass of glögg. Don’t know what glögg is? Check back once the weather turns cold- I’m sure I’ll make it. Great blogger brunch today! So great meeting some new Chicago bloggers- recap on its way tomorrow! What are your favorite kind of meatballs? Did you grow up with the massive marinara-covered Italian style ‘balls (a là The Wedding Singer), or did your parents take you to IKEA for the Swedish variety? Or how about tofu ‘balls? I hear those are pretty slammin’. i haven’t had swedish meatballs in forever – they’re so darn good!